Taking the plunge! Ann Ross plunges downwards in a spectacular swan dive in the same fearless manner that teachers should dive into word inquiry. 1942 photo taken by Gordon Coster for Life magazine. I recently worked with my niece, a neophyte teacher. I like to think I’ve enthralled people over the years with intriguing tales about words. However,my family and friends have said that I’m more likely to have locked any route to escape and trapped people in these conversations blithely ignoring glazed looks on my hapless victims. Madeleine was one of my early victims suddenly becoming busy as I opened my mouth to talk about an interesting etymology! Yet some aspects of these conversations must have lingered and we have begun to skype regularly to discuss the ways of word inquiry, morphology and etymology – all music to this word nerd’s ears! These conversations spark a frustration that student teachers have had no instruction in the teaching of spelling, that orthographic understanding has not been attended to throughout their university courses and that all too frequently teachers, new and experienced, are expected to address standards and benchmarks in various curriculum documents that at best are confused and more frequently totally incorrect as regards orthographic knowledge. I will resist the temptation to divert to all the inaccuracies and misunderstanding of the terms in the above curriculum statements such as ‘blends’, ‘silent letters’, ‘irregular verbs‘ and the ludicrously inaccurate statement “less common letter combinations, for example ‘tion’”. Madeleine, however, is attempting to meet the curriculum requirements but in a manner that uncovers the structure of the words. She wants to ensure that knowledge gained from word inquiries will be applicable to many words. She will not be dominated by lists or give pointless exercises that fail to extend thinking and develop accurate understanding. Madeleine and I spent a workshop day together where she quickly recognized the importance of morphology. This she felt was an appropriate place to begin word inquiry with her students. After two sessions she and her students now understand that <-tion> is never a suffix. 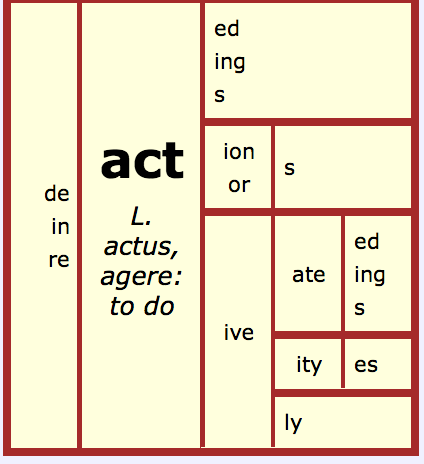 How can you explain <action> if *<-tion> was the suffix? Recognizing that the <t> is indeed part of the base element ( in this case free) Madeleine and her students saw, the base element <act> has many relatives: actor, active, inactive, reactor, reaction, activity. They are aware, as her curriculum documents are not, that the suffix <-ion> is productive and thus common. Madeleine invited me into the classroom in which we led a joint inquiry with two classes of students and observing teachers. We had decided to continue to consolidate morphological understandings and therefore had students work to identify words which belonged to a morphological family. Madeleine explained that words have families which share a common base element and a common root. Today they were to look for the members that shared the same base element and then show this in a web adding to this if they could think of any more members. As we gathered together to discuss and share some of the words, we discovered that some words involved the removal of a final non syllabic <e> : <active+ate> –>< activate>. Rather than tell students why this happened, I suggested they consider the words: <like> and <liking>, <time> and <timely>, <activate> and <activator> but <active> and <actively>. English orthography is orderly and follows conventions. We suggested they consider their hypotheses about this over the holidays making sure to gather evidence to share when they returned. Throwing down the gauntlet can spark interest and enthusiasm. Students like to be able to think , to develop hypotheses, to collaborate to reach understandings rather than force fed facts and mindlessly work through activities. Immediately after school six students gathered around us to share their thinking. We urged them to gather evidence in support rather than be reliant on an immediate response as to whether a statement was right or wrong. As Madeleine discovered, and observing teachers noted, students took to this immediately. There was no learning the definition of the linguistic terms but simply an immersion in the terminology and an expectation that students would use this language when sharing their findings. We discussed how they as word scientists needed to bring scientific rigour in their language of explanation. Spelling makes sense- it’s all about meaning. Morphology allows meaning to be the focus and reveals the structure of words. In a workshop after school with teachers we discussed the instructional implications of word inquiry and the lesson observed. Help! What next? Where does Madeleine go from here? Word inquiry is not prescriptive and a scripted series of ladder-like lessons all teachers should follow. Word inquiry can begin anywhere with any word. It can be sparked by a teacher question or a student question. The next step is based on the teacher’s observations of her class. What needs clarifying? What needs more inquiry or more practice? At all stages ask: What does the word mean? How is it built? What are the relatives? Below are a few of several possibilities Madeleine and her class could investigate. Matrix: Build words from a matrix /construct matrix. ( Students had informally been introduced to matrices as I shared their words as the spelled them aloud on a quickly drawn matrix in the classroom). Start with the matrix <watch>. Spell aloud, pausing between morphemes.Use the matrix <watch> to build as many words as possible writing out the word sum and the synthesis of this. 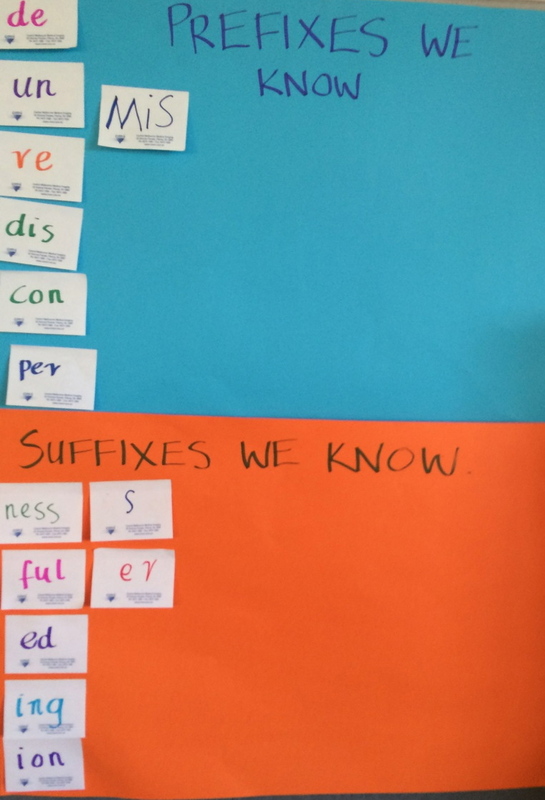 Suffix Chart: Begin a classroom chart from the suffixes students found in their inquiries into the word families. Suggest students write the suffixes they have found, and can prove with examples from other words, onto sticky pads or small pieces of paper. The 2/3 class chart of affixes. Students are eager to add to this as they discover more. Suffix sort: Once you have a collection of suffixes ask students to ‘spot your principle’ i.e. sorting by whether a suffix is a vowel suffix or a consonant suffix. It is only the vowel suffix that will force a change to the final non- syllabic ( “silent”) <e> in the final position of a base element or the final position of another suffix such as the suffix <-ate> or <-ive>. A vowel suffix will also force the doubling of a single consonant letter preceded by a single vowel letter under certain circumstances ( material for another important inquiry). Note: 1. The hyphen to the left of the suffix is the linguistic symbol of a suffix indicating where it is attaches to the previous element- either a base element or another suffix. Note: 2. Never refer to suffixes as “endings” as that is simplistic and untrue as a word may be composed of just a base element ( free ) or a prefix and a base element or a base element and one suffix, a base element and two or more suffixes. Denotations: What does the word mean? Ask students what they know about the word from the context it’s used. Start with <watch>. How is this different from ‘look’ or ‘see? Develop a ‘working definition’ with students in their own words so that students can revisit this as they build up their knowledge/experience of the word. Do this while exploring the morphology and etymology,. Don’t just accept one denotation, read and compare the denotations from several dictionaries. Ask for examples of where the word can be applied. For example if the word is a character trait- ask students which characters exhibit the trait under investigation. Ask them to justify. Ask for other examples from texts or movies and a justification. How is the word built? Ask students to analyze the word into its elements through a word sum: prefixes, base or bases and suffixes. Accept all hypotheses but make sure to ask for evidence. This way the evidence confirms the hypothesis. Examples: what other words contain the prefix….., what other words share the base element …? What other words have the suffix…? To help both students and you as the teacher, go to Neil Ramsden’s word searcher. However remember this is raw data and just because there are superficial similarities- a string of common letters- does not mean that this is evidence of an element. Consider the base and emphasize that this is the ‘heart” of the word- it carries the core meaning. Justify patterns, principles, morphemes or grapheme choices. Find someone who can …. A great way to consolidate learning. Analyze miscues explaining what principle a student may need to know. Regard miscues as interesting reminding students that no-one makes a mistake on purpose. For example a miscue in the web above is *whatching. 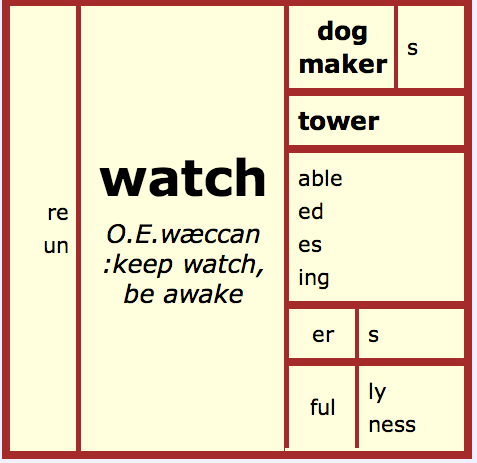 Justify the spelling of <watching> through a word sum <watch+ing>. Investigate the etymology of words. The Online Etymology Dictionary is an invaluable tool as tool as is John Ayto’s Word Origins which is available as an ibook or in hard copy. Discuss a word’s meaning in association with its root. Word inquiry goes beyond lists of unrelated words. Word inquiry is challenging for all students and involves scientific methodology: formulating a question for research, developing a hypothesis, gathering evidence, refining the hypothesis. It allows students and teachers to work together as co-learners. Madeleine, like many teachers, worries that she must be an expert to be able to teach this way with her students. Relinquishing the role of expert can be liberating for learning if you allow questions, help students gather and examine evidence then allow them to write to experts which increasingly includes other students. Word inquiry by focusing on morphology right from the beginning, develops vocabulary in meaningful ways. All students saw that being a <scientist> involved knowledge and that being <conscious> meant being aware and knowing while being <unconscious> meant unknowing. To be <omniscient> meant all knowing. 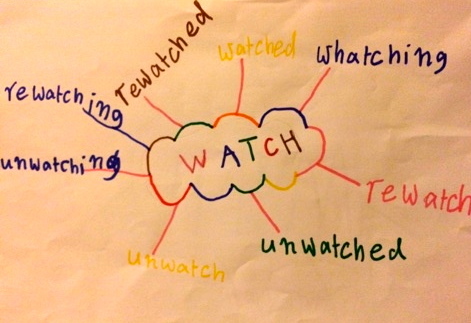 Spelling is more than lists on a Monday morning and getting these words right by Friday afternoon- it is about understanding, noting structure, the patterns and making meaningful connections. 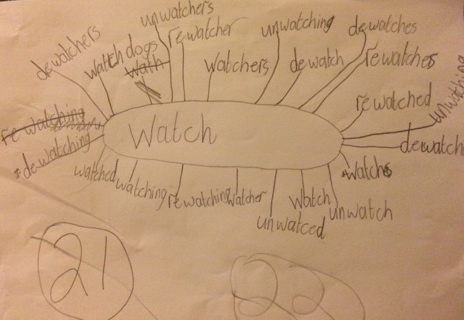 It is all about discovering the sense and order inherent in the English spelling system. For these grade 2/3 students, their teachers have plunged with them into wordy waters where they as word explorers they will uncover the tales of words from distant lands, find family connections and relationships of the past and discover that the English word hoard is indeed a treasure chest just waiting for inquiring minds to unlock … for each word has a family, a past and like us, a story to tell.